This week’s post will be brief compared to most. Well, brief for me I suppose. Starting this week I’ll begin working on my small project I’ve mentioned a few times over the past few posts. Well, I plan to start as long as my Outlook and Gmail begin to play nice with one another again. What is this project you ask? Well, I’ve decided to begin posting player profiles of some of the more widely known warlocks throughout the WoW community. It will be a small interview style questionnaire about which specs they enjoy playing, and covering what they enjoy most about being a warlock, and everything else. Why am I doing this? I think it will be a good idea to show the wide range of players and personalities that share in the love of our wonderful warlock class. I hope the series highlights the fact that not all warlocks are a juvenile delinquent males between the ages of 13-17 years with a penchant towards being emo. Now, if you have any questions you’d like to see added, please let me know and I’ll put it on the list. In fact, I’ll be posting the outline of the questionnaire this weekend and I’ll let all of you help me make the decision of what to include. So please let me know what you think! So the 5.2 patch dropped this past Tuesday and it’s been nothing but one big flash, a big bang, and a big flurry of new content and news. Hrm, I wonder if that’s why they call it Isle of Thunder because all of the reverberations it’s left behind? For me, it has become one very long, and over extended camping trip. Many of you know that I’m not planning on giving out any spoilers concerning the quest for our long sought after fel green fire. In fact, up until this point I’ve avoided reading anything about the encounter. Some things for me are better experienced as they happen as compared to reading about them. So I’ve tried to refrain from reading about anything concerning the new warlock quest line. 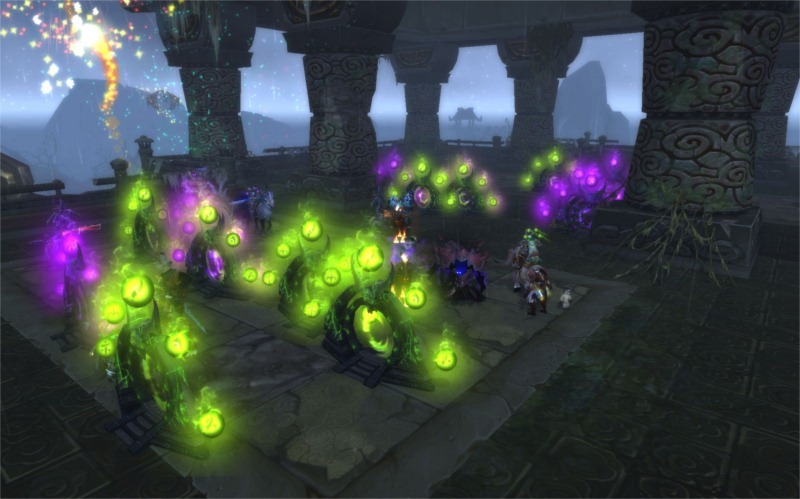 As much as Poneria’s article called, How to get green fire for your Warlock in Patch 5.2 tempted me to read I still can’t believe I refrained from peeking at it, and yes, I wanted to so badly! Well, that was until I logged into my guild vent late Tuesday night. Tuesdays are raid night for my raid team. So when we finished for the night I immediately ran out to complete the new daily quest hub. Yep, it was Quel’ danas-ish, and quite Tol Barad-ish, but it was new and shiny so I didn’t mind. I really enjoyed reading the quests and getting caught up in the excitement of it all. 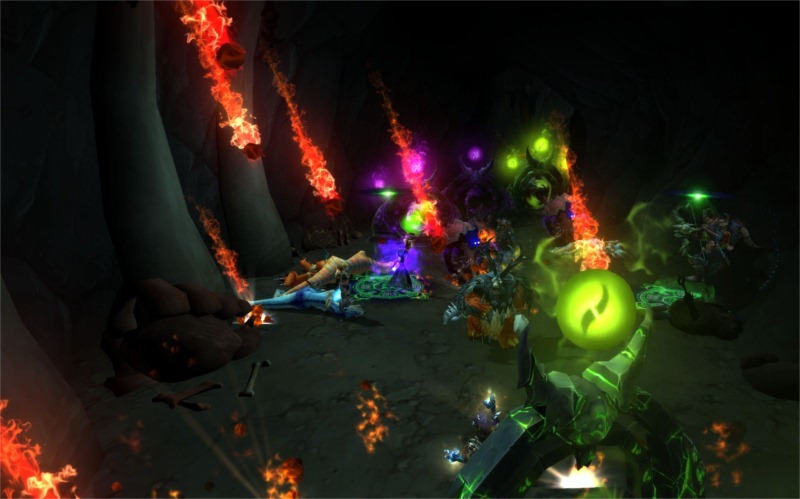 The only thing I had heard about the quest for green fire was that the tome above would drop from a random mob. Okay, fine. A random drop from a mob means I’ll have the same chance as everyone else…or so I thought. In my evil little mind I instantly knew that starting on Wednesday I’d be heading out and that I would start farming. 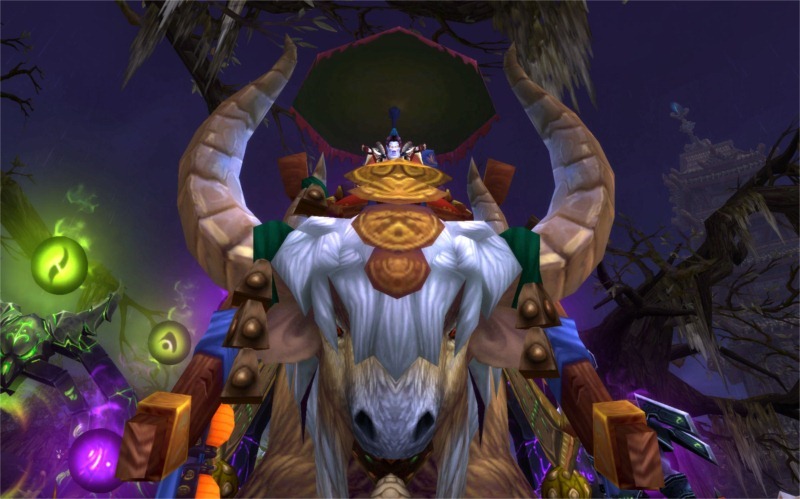 I would farm, farm, farm until the Taurens cows came home. I’d rinse and repeat every night until the drop became mine! Mine all mine! Muahahaha! 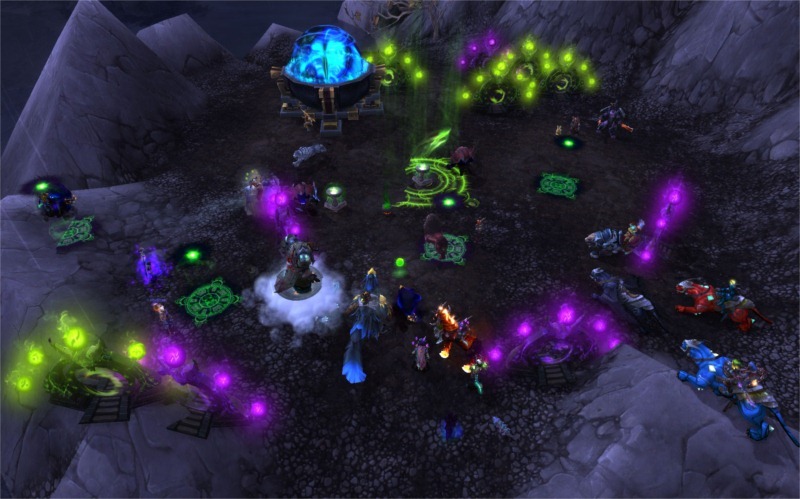 <General><warlock 1>Who’s spawning next? Anyone know the order? 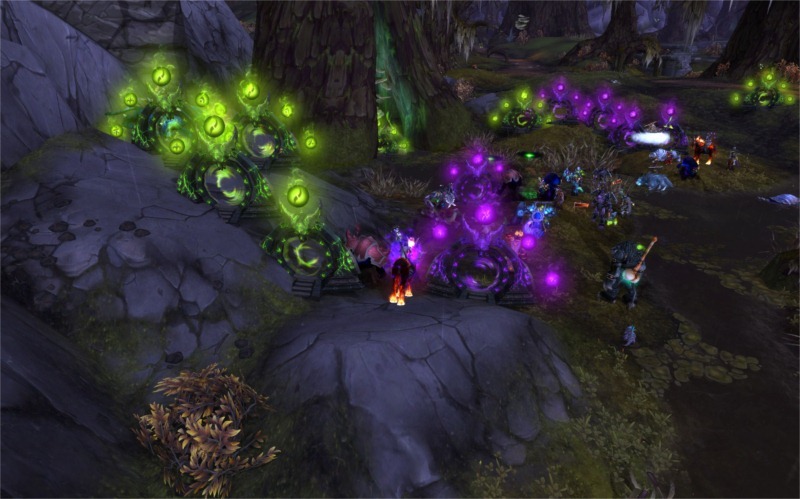 <General><warlock 3>Omg it’s a warlock convention out here! <General><warlock 1>Ugh! Who’s next? OMGWTF Blizzard! <General><warlock 38>Been here 3 hours and I’m done! <General><warlock 36>Ally just tagged Rasha as I was killing his guards! <General><warlock 18>This is all sick joke and I’m paying people money for this? 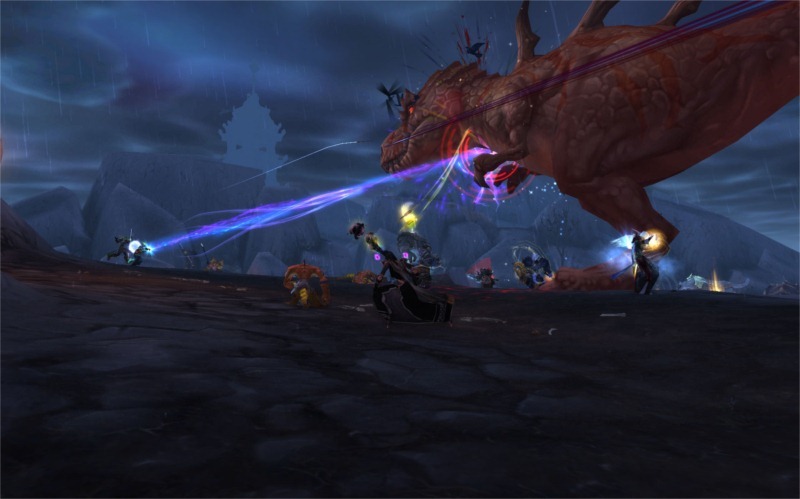 <General><warlock 39>I still can’t loot Mumta! Cluster is a good word. I can also think of another that word that the warlock in me would like to add to it, but for the parent in me, I won’t mention because that’s what seeking the Tome of the Lost Legion had become…a cluster. Within minutes I was having to Alt-tab out of the game and to start consorting with the Twisting Nether to make sense of it all and to try to sort things out. Btw, if you’re a new reader to this site my version of consorting with the Twisting Nether begins by going to goggle and typing in my search words. 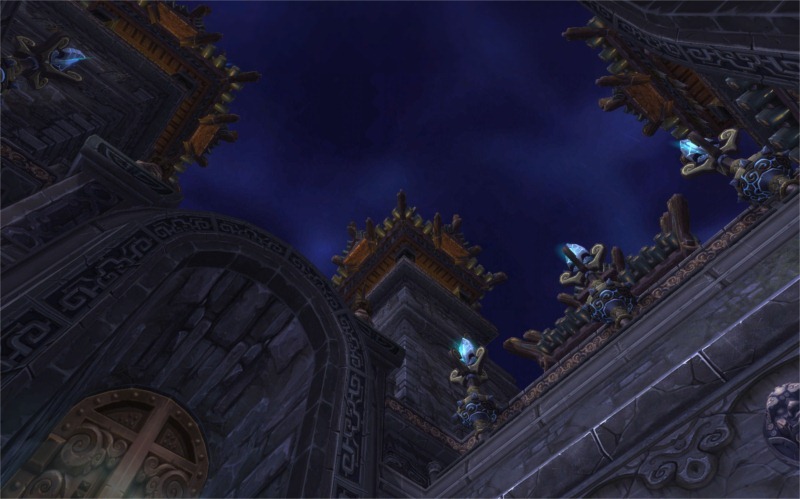 This time, my incantations and visions led me to Wowhead to read up on the Tomb of the Lost Legion. Unlike my original understanding of where the Tome of the Lost Legion would drop, I came to find that in reality it was a little bit different. 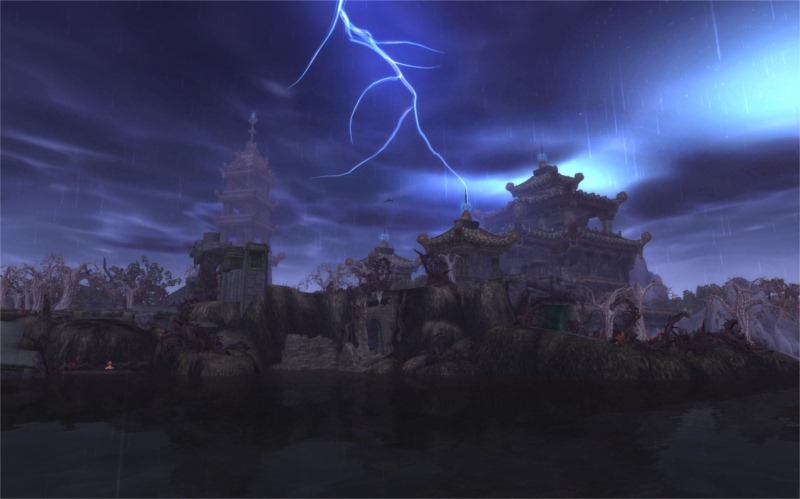 From what I’ve researched the Tome has a very small chance of dropping from any mob out on the new Isle of Thunder, but it appears to have a higher chance to drop from one of the six elite spawns that are spread at various locations on the Island. It also appears that they have about a 40 min respawn timer. 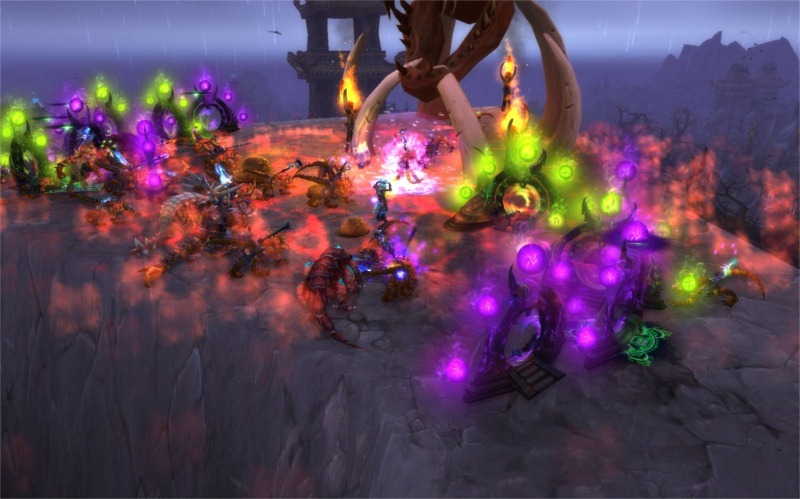 Since these mobs are killed at varying times, their respawn order will change too. It soon became noticeable that the loot bug seemed to get worse once you made a full circuit of taking down all six mini-bosses for the first time at the start of camping for the night. The running away and returning fix was the one that drove me the most nuts. The reason being is because the distance you had to run varied from mini-boss to mini-boss. You’d spend 1-3 minutes running out and then running back only to find out the hard way that you still were NOT able to loot the corpse. The most upsetting was when none of these work-a-round fixes worked and you had to give up trying to loot the elite mob altogether. Yep, it was painful and no I wasn’t giving up. I was also elated to have Fimlys and Hydra, from the Twisted Nether Blogcast, send me an invitation to take part in their Roundtable discussion about the 5.2 patch. The other guests slated to take part was also Navimie from The Daily Frostwolf, Sunnier from Sunnier’s Art of War and Rho over at Realm Maintanence. Since Rho and Hydra are both warlocks we had quite the discussion concerning the Tome of the Lost Legion and all of the problems surrounding it. 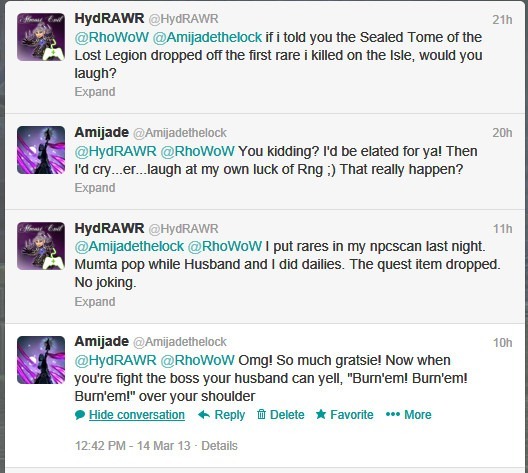 Like me, Rho had been camping the rares for the elusive tome too. I’d see him every night alongside all of the others during my camping out on the Isle of Thunder. On the show Rho admitted that he had given up on the idea of continued farming for the drop until the issues were resolved. Hydra stated that she wasn’t even going to attempt it at this point as well. As for me? Well, I’m going to continue to camp because getting the Tome now has become a small goal. It’s like running a marathon where you have have absolutely no chance at winning, but you compete anyway to motivate and push yourself that you can do it. I had so much fun participating on both shows that I’m glad I didn’t politely decline due to my nervousness over doing any “live” broadcasts. If anyone has sent me an email over the past two weeks or so I apologize if I haven’t responded. In fact, I apologize because I might have lost it forever. Long story short, I got a computer virus that corrupted my email program and now my Gmail account and my Outlook hate one another. I’ve done a complete reload on Outlook and I still can’t get it to work! I’ll hope to have it fixed by this weekend! How has all of this farming played out? Omg! I just realized when or if ever I get done getting the Tome of the Lost Legion to drop for my horde warlock, I’m gonna have to rinse and repeat on my Ally toon toon as well! Bah! Have a great week everyone and until next time if you plan to go camping, make sure to bring friends because misery does love company! Happy camping! 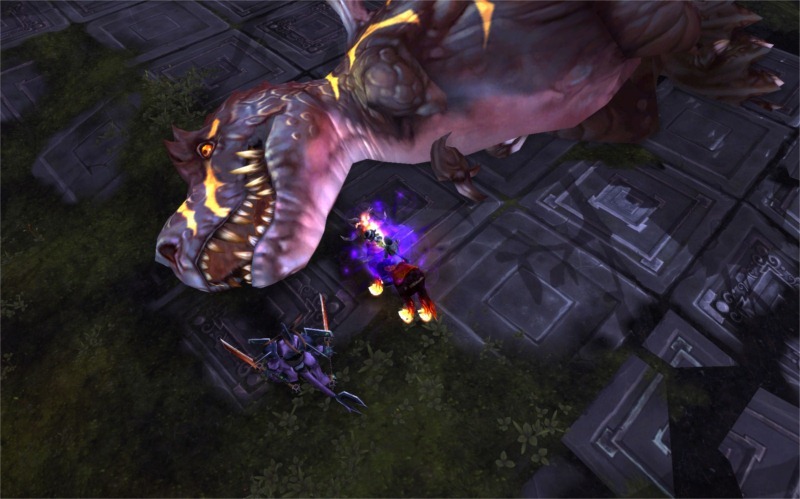 Sasche hasn’t found the Tome either but then I realized she kills the rares and runs off without looting, sigh. I must have a chat with her. Good luck! I’m hoping that in time, when more folks have gotten the Tome, that this part will become a little less crazy. Otherwise, I fear my wee baby warlock will have to stick to the red fire. I just don’t think I could handle all this crap you’re going through! Well, despite my bloodshot-eyes and my lack of extra sleep I’m still having fun. I’m enjoying getting to know more ‘locks on my server and hanging out with my peers and peeps in my guild vent as we farm the elites of the Isle. With this much work it saddens me that for a casual player the chance for a cool quest like this to drop will probably be slim to none. However, I know three people now who got it on their first kill on one of the elites. So there is still hope and lucky RNG. It just happens that it hasn’t been so kind for me. I have been killing all the rares every day since the patch dropped and I have yet to see a book drop. So don’t feel bad Ami! I feel your pain! Gaaaaaaaah! Blizzzzzzzard make it drop! Hahaha! Well, the more it doesn’t drop the more it spurns me on to find it. I’m annoying and OCD that way. I hope you get a lucky proc as well. The last thing I hate to see anyone do is go purchase it from the AH, but at this point I can’t say as I blame them. Guess that means when my lock finally hits 90, there should be little competition eh? Good luck on your quest. To say that there’s a little competition is an understatement! During the evening hours and during peak times there’s usually an average of about 8-10 warlocks standing around killing the elites on IoT. On the weekends, it’s much busier. Hopefully it’ll clear out a little in 1-3 months when I hit 90. I’m sure in a few weeks you’re probably right. It will make farming much easier as the area clears out more as people get tired of doing the dailies. I spent a fair few hours running all over the isle following the groups. Suddenly it hit me. I’m an Affliction Warlock. The only ‘Fire’ spell I use is Fel Flame and that’s already green. To each his own is a good way to look at it. Just because I’m making this a new career doesn’t mean I expect others to do the same. Nor does it change my view on other warlocks who have decided to wait and see. Well there’s also your RoF spell for Afflock too ;) I’m really after fighting the end boss and seeing the questline and that’s my only motive. The green fire changes are just extra icing to me. Even if the spell effects didn’t change, I’d probably still be camping the Tome just for the content and story line. Btw, great start to your blog :P I shall troll you when I can! Wow that Hydra has good luck! Can you believe it LOL! Low pop server, is all I’m going to say. Well, I was going to say, don’t pop by my blog and read my fiction story about green fire until you get yours because I don’t want you to be any more green… or you might turn into a frog.